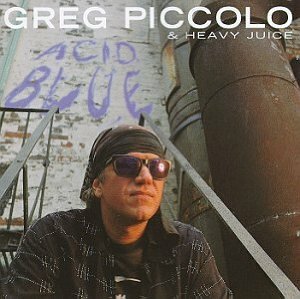 For parts of the last five decades Greg Piccolo has been a major contributor to the blues and vintage music scene. 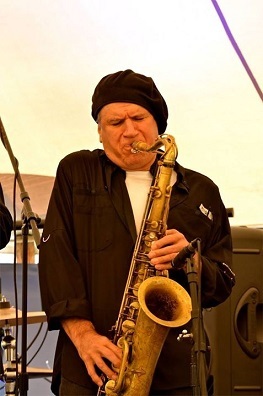 He is a monster tenor sax man who has played with some of the biggest names in the business. He is also a harmonica player, guitarist, vocalist and songwriter. He came into national prominence as one of the original members of Roomful of Blues. In recent years he was part of Jimmie Vaughan’s Tilt a Whirl Band. For years he has led his own New England based trio while remaining an in demand side man. I caught up with the Connecticut native who still resides in the Nutmeg State. In this interview, the 63 year old musician looks back on his life in music and looks ahead with renewed vigor. Piccolo plans on creating what he calls “his sound” for years to come. Enjoy a candid conversation I had with Greg Piccolo. David Mac (DM): Hi Greg. Let’s talk about your early exposures to music and your development as a musician. Greg Piccolo (GP): When I was kid we used to listen to my parents Hi-Fi which was in their bedroom. My sister and I would just jump up and down on the bed while listening to music. One of the first tunes I remember latching onto was Happy Organ by Dave “Baby” Cortez. I started a band when I was thirteen. I loved the sax solo in the song The Wanderer by Dion. I found out that it was a tenor sax on that record and it sparked my interest in that instrument. By the time I was thirteen however the Beatles came to America and all the music I loved on the radio from the 50’s was all gone and so were the sax players. DM: This past week was the 50th anniversary of the Beatles appearance on the Ed Sullivan show. I often think how different popular music would be if there was a tenor sax in that band. GP: That is so true. The guitar replaced the tenor saxophone as the lead instrument in rock and roll almost overnight. When you think about it when you get fifteen different tenors players playing the same instrument you get fifteen different sounds. The guitar is like that to a great extent, but it is even more noticeable with the tenor. I like the variety and different textures the tenor brings to the bandstand. By the way, Dave did you see that Beatles special they had on T.V. last Sunday night? GP: I did and all I kept thinking was that there is something weird about 60 or 70 year olds listening to ‘Get Back Loretta.’ I mean, can’t you people move on? I can see it if you were a kid or something but that music just doesn’t age that well. When you get real blues, real country or jazz music, age doesn’t matter. The music is timeless. It ages real well. It is music for adults. DM: That is so true Greg. If we live a full life the percentage of that life when we are children becomes very small. Yet that small window is what still dominates many people’s thought process as it relates to music for the rest of their lives. GP: Music is marketed like everything else. It is directed at kind of a herd mentality. DM: Yet you were a teenage musician in the age of Beatlemania. GP: That’s right. I went through my teenage years playing in a little rock and roll band with guitarist Duke Robillard. DM: What kind of stuff were you playing in those days? GP: It was mostly Beatles and Animal songs. We practically had to. It was almost expected in those days. I was the singer. Then I started tooting into an alto. By the time I was sixteen I switched to tenor. I would do songs by the group Traffic because they had a few numbers that featured the tenor a little. But there wasn’t all that much call for a tenor, so I put it down until I joined Roomful as a permanent thing when I was nineteen years old. DM: Let’s talk about this early incarnation of the musical institution known as Roomful of Blues. GP: Duke was kind of the guru. We all followed him musically. Everyone kind of followed his lead. Everybody liked what they liked musically, but Duke gave the band a direction. He was the one that turned me on to Lester Young, Coleman Hawkins, Illinois Jacquet, Arnett Cobb, Louie Jordan, Gene Ammons and Ben Webster. Once I heard that stuff, my first thought was, ‘I wished I knew about this stuff ten years earlier’. Anyway, we began to develop that Kansas City sound. 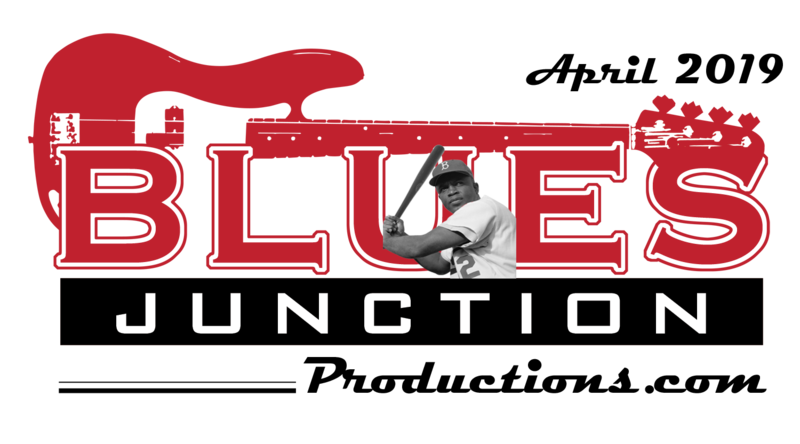 At some point around this time Duke got turned onto Buddy Johnson and that was the seed that spawned our sound. For us it was perfect. We got Doug James in the band playing baritone, Rich Lataille had been with us by that time playing alto, so we had three saxophones. For years we drove around playing 300 nights a year listening to the same music. Whatever Duke wanted to hear is what we listened to. DM: …and what was that? GP: T-Bone Walker, Duke Ellington, Lucky Millander, Wynonie Harris, Count Basie, Roy Brown we listened to it all and we listened to it all together. We didn’t even listen to the radio for ten years. DM: I don’t recall back in those days anybody else doing the style of music you were playing. GP: No, there wasn’t anybody doing what we were doing. We weren’t responsible for the music but I think Roomful, and especially Duke in particular, was responsible for the revival in this type of music. Duke was such a great player. We would follow him anywhere. I think we were responsible for a lot of other musicians finding out about this music. There were also other bands in different parts of the country doing variations on vintage music. I don’t know if they got into it as deep as we did. I always tell young players if you want to move forward you have to first take a step back and learn where it all came from. We created our own era by going back in time. We never saw those bands whose music we admired, so we never realized then that they had these incredible stage shows with matching outfits. So we had this kind of hippie look, but we had an authentic sound. That’s all we had was sound, so that is what guided us. DM: There was another band from that same period, like Roomful, that really got into it very deeply during this time. GP: The Fabulous Thunderbirds! That was the other band. When we heard them we said, ‘Oh my God. This is it.’ They are great at what they do. They know where it came from. Our two bands were totally different from one another and what was out there for the most part. They felt the same way about us. They couldn’t believe what we were doing. DM: You have worked for many years with the guitar player in that band, Jimmie Vaughan. GP: I love Jimmie. I call him the Louie Armstrong of the guitar. GP: I know I am comparing a trumpet player to a guitar player, but Louie is the only guy I can compare Jimmie to. He gets mad when I say that on stage, but I mean it. I have to compare him to Armstrong because there is no guitar player that I can compare him to. Jimmie’s sound invokes Louie’s playing in my mind. Jimmie has this great tone. He has the ability to play sparsely. Every note he plays means something. Every note is supposed to be there and he leaves out all the ones that don’t belong. It’s just perfect. On top of that his rhythmic sense is impeccable. He probably has the best rhythmic sense of any guitar player I ever worked with. Every time he calls, I am there. I just love playing with him. He puts it out there every time. He is fearless. DM: In a sense even Jimmie’s band here in recent years is kind of a Roomful reunion. GP: Yeah, that’s true. It was me and Doug playing together again and Lou Ann (Barton) as the featured vocalist. She, as I guess you know, sang with Roomful back in the day for a bit. DM: That was during a transitional period for the band. GP: That’s right. Duke left the band. That’s when we added the trumpet and trombone to the mix. I felt we had to add these elements to the band to make up for the loss of Duke. Ronnie Earl stepped in on guitar. I had already been doing some of the singing on Louie Jordan and Tiny Bradshaw material that was in the higher register, but it was during this time we got Lou Ann. DM: How did that come about? GP: We were on a gig at Knickerbockers in Westerly, Rhode Island, where we used to play every Sunday night. Stevie (Vaughan) opened for Roomful and he had Lou Ann on vocals. I remember we paid them thirty dollars for the whole band to open up for us. So Lou Ann quit Stevie’s band that very night and joined us. That only lasted a few months because she couldn’t stand not being in Texas. She was way out of place up here in New England. It was great while it lasted. She is kind of like a female Little Richard. She just has those chops. When Lou Ann left it was up to me to carry the singing load again. When we got Sugar Ray I kind of stood back. He is such a great singer. DM: There are a couple of Roomful albums I would like to talk about that came out in 1982 and 1983. Both were produced by the legendary Doc Pomus and feature two of my favorite musicians that are wonderful late career entries into their prodigious catalogues. GP: Oh yeah, we did two records; one with Eddie “Cleanhead” Vinson and the other with Big Joe Turner. Doc idolized Big Joe Turner. Doc was a singer himself and had his own ten piece band. He had Mickey Baker on guitar. He was kind of the white Wynonie Harris, Roy Brown or Joe Turner. We would have never approached him. He found us. GP: He heard us at the Bottom Line in New York City and just flipped out. Every time we came down to New York City to play Doc would come out to our gig. 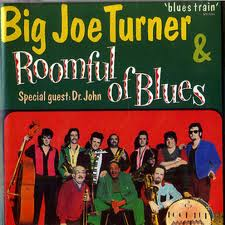 That’s when he got it in his head that Roomful should make a record with Big Joe Turner. He just wanted to do what he could for Joe. It actually helped us a lot by making that record with him. DM: That’s pretty heady stuff working with the legendary Doc Pomus. GP: The ironic thing for me was I only bought one Elvis Presley record as a kid. It was the 45 of Little Sister and the B side was His Latest Flame. I loved those two songs and Doc wrote both of them and he ends up producing those two Roomful albums. It was pretty cool for me to be in that situation. DM: Greg, your sax has taken you to some other pretty cool situations, including playing at Carnegie Hall during this period. GP: Yes that’s the good news. The bad news was I had to wear a mariachi costume. DM: (laughing) Yes, I know. I wasn’t going to bring that up, but since you did you had better explain. GP: We backed up Stevie Ray Vaughan for that show. He made everyone wear custom fitted mariachi suits. He brought in the entire Roomful of Blues horn section which included myself, Doug James, Porky Cohen on trombone, Bob Enos on trumpet and Rich Lataille on alto. The best part for me is that my parents got to see me play at Carnegie Hall, even though I was wearing a mariachi costume. DM: I’ll bet Jimmy didn’t wear one of those costumes. GP: He did. The difference is he looked cool in it. DM: (laughing) I don’t know why, but that doesn’t surprise me. I would love to talk about another album that has been one of my favorites now for many years. It is your first solo album, Heavy Juice. GP: I was still with Roomful when I made that record. Ronnie Earl our guitarist at the time was making a solo album with Hammond Scott of Blacktop Records which I was playing on. Ronnie told him he should do a record with me. I really wanted to make a record with Blacktop. It is the only label I wanted to be on at the time. Hammond came up to Boston. He sat back and let me do what I wanted. I have to give him credit for that. The first thing I had to do was to think of who I wanted on the record. What I didn’t want to do is have revolving door of guest stars which is a pretty common thing these days. I thought I want to put the band together that would be the best for the music that I play. 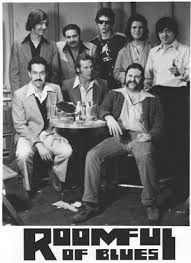 So I got all the original Roomful guys, Duke Robillard, John Rossi on drums, Preston Hubbard on bass, pianist Al Copley, Rich, Doug, Porky as well as Carl Quaforth on trombone and Bob on trumpet. That record was the best of both worlds for me. GP: I had the best band and I got to decide what we played. We did everything in one take. We would go in there and boom, knock it out. It is a cohesive record with a great sound. Al Copley wrote out the Buddy Johnson horn arrangements. He wrote the parts out for everybody. DM: That record does have a great sound. Where did you cut that album? GP: Thanks for asking Dave. We did that at a place called Newberry Sound in Boston. After we made the album they cut the studio in half. So after they chopped the studio up, I thought, ‘It’s gone. That sound will never be there again.’ I can listen to that record like it’s not even me. DM: What do you mean by that? GP: I rarely listen to my records, but when I listen to that record I don’t dwell on what I did wrong or think that could have been better or I should have done this. I can listen to Heavy Juice and just enjoy it. DM: Next up was your second solo album Acid Blue. GP: I made that record after I left Roomful and it is the reason why I left the band. I was writing songs and I didn’t want to neglect them. Fantasy Records signed me up and gave me a deal. I did two records with them. There are some good songs on that album. DM: There is another aspect to your career that I would like to talk about and that is your role as a sideman. GP: I am always happy to play with other people. If there is someone out there that I respect musically and they want me to do what I do and play on their record, I am happy to do it. I am happiest when I am doing side projects that are short lived, so that I can get back to making the music that is in my heart. DM: …and what is that? GP: What is close to my heart is my own trio. It is why I left that steady gig with Jimmie coming up on two years ago this April. It was not that I didn’t love what I was doing with Jimmie. It was because there was something else that was in my heart that I wasn’t doing. I will be 63 years old in a couple of months and I have always done musically exactly what I wanted to do. I have always followed my heart. I have been very lucky to do exactly what I want to do musically and make a living at this. Right now I am doing a lot of ballads and jazz stuff. Not that I am jazz guy, but I can play the songs and can play them with my sound. I feel that I have a voice that is worthy. I don’t care if it is a dive, I’ll play wherever people want to hear my music. If someone wants me to play at the Lincoln Center I wouldn’t bat an eye because I feel my music is worthy of that as well. I am happy doing my stuff and letting people hear my sound. DM: How would you describe your sound? GP: That’s a tough question. DM: Yes I know. It is difficult to describe sound with words. I should phrase this question in a different way. 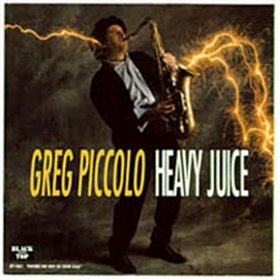 What do you think of as the Greg Piccolo sound? GP: (pause) Well...You have to first imagine the sound that you want to make. The sound that I imagine may not even be a real sound. It is the sound that I heard on those old 78s that were made in the 40’s and 50’s. I know that with modern technology or in a live performance, that sound may not even exist, but it is what I think it would sound like if it did. Does that make sense? Illinois Jacquet, Lester Young have that rich mid rangy sound. There isn’t a lot of high end stuff going on. It has that rich in your face presence. You know what I mean Dave? That is what I shoot for. DM: Who are the others that you think about when you play. GP: It is still Illinois Jacquet because he is the first bluesy jazz player that I latched on to. Then there is Gene Ammons, who has always been a favorite. Jimmy is really into Gene Ammons. Ben Webster has kind of taken over in recent years. He plays so many ballads and I have been doing a lot of ballads lately. DM: What would you like to do next with your music? GP: I would like to present my music in more jazz rooms. I will probably fall between the cracks there as well. GP: I mean even with all the success that Roomful had, we fell between the cracks just like the old rhythm and blues bands did. People would say back then, the way they did with us. “This isn’t jazz, this isn’t beat yourself over the head blues either. It swings hard, so what is it?” You know as well as I do Dave that the great rhythm and blues bands didn’t really fit neatly into a category. Maybe that’s why that sound kind of fell off the radar for many folks. It is great music that is just hard to define but that’s what I do. DM: That’s exactly what is so cool about it as far as I am concerned. GP: As far as being accepted in the jazz world I feel that jazz is a broad open minded field anyway. I know the players would accept me because they would understand where I am coming from with my sound and my music. I have played in jazz clubs and they accept what I do. The people seem to like it. I just try and make a sound that has the tone that is my voice. That voice is probably recognizable to a lot of people. DM: I would hope so. You have been doing this for a long time Greg. Is there any topic or area of discussion that we haven’t touched upon that you would like to bring up? GP: Yea, Get me a gig. Come on, they must have a slot for a tenor player at the Long Beach Blues Festival, Dave. DM: Sorry Greg, that festival is long gone. Blues festivals seem to lean very heavily on blues-rock acts and classic–rock acts. What would you like people to know about Greg Piccolo? GP: I would like them to know I am still here. A year ago on February 8th I had major open heart surgery. The doctor saved my life. I had an aortic aneurism. I had a leaky valve. The Doctor said the aneurism would have killed me if they hadn’t found it. They found it because of the leaky valve. Because of that I look at it as having a whole new lease on life. I am good to go and I am planning on hanging around for awhile. Even though I am fortunate to have steady gigs and be able to do my thing, with my trio close to home, I am willing to travel. I am looking for an agent. I just want to play. DM: Fans of your music are very lucky we still get to hear you play. I enjoyed our conversation today. GP: Thanks Dave. Stay in touch.